Instant downloads of all 946 LitChart PDFs (including American Sniper). Chris Kyle ships out to the Middle East in 2003, only a few months after marrying his wife, Taya Kyle. Throughout American Sniper, he writes about his conflicting loyalties: he loves Taya and his children, but he also wants to serve his country in Iraq. In a different sense, American Sniper shows Kyle negotiating the tension between country and family—the war front and the home front. For most of the book, Kyle ranks his duty to his country above his duty to his wife and children—he defines himself as a soldier first and a husband/father second. Again and again, when Kyle has the opportunity to retire from the SEALs or reenlist, he chooses to reenlist, even when Taya begs him to stay with her and help raise their children. There are many reasons why Kyle chooses the SEALs over his family: In part, he reenlists because he’s been raised to feel a strong sense of duty to his country and his fellow Americans. At the same time, however, Kyle genuinely enjoys the thrills of fighting in Iraq—over and over he brings up how “fun” and “exciting” SEAL life can be. Another reason why Kyle prioritizes military service over family life is that the rules of machismo tell him that reenlisting is the right, manly thing to do. A final, particularly sobering reason that Kyle reenlists is that he can seemingly no longer connect with civilians, even his wife and children—danger and combat have become such an important part of his identity that he struggles to have a normal relationship with anyone who hasn’t had the same kinds of experiences. Toward the end of the book, Kyle begins to reevaluate his life. Gradually, he comes to define himself as a husband and a father first, and a SEAL second. On one hand, the trauma of war begins to leave a mark on Kyle (see Trauma Theme). At the same time, Taya’s need for Kyle becomes more immediate: their daughter is seriously ill and needs to spend time with her father. As a result, Kyle agrees to leave Iraq a few weeks early and not reenlist in the SEALs in the future. Ultimately, it’s very unclear what to think about the tension between country and family in American Sniper. There’s never really a moment when Kyle manages to balance his love for his country with his love for Taya—realizing one means sacrificing the other. Kyle seems not to regret his decision to leave Taya so soon after she gives birth, or his decision to reenlist rather than help her raise their children. But at the same time, Kyle never outright says that country is more important than family. Another sign of the book’s ambiguity on this issue is that Taya writes that she and Kyle still disagree about whether they want their own children to serve in the military, suggesting that she and Kyle haven’t reached any real compromise in the conflict between country and family. In the end, people like Kyle must simply make up their own minds about whether to prioritize their families or their service to their country. The ThemeTracker below shows where, and to what degree, the theme of Country vs. Family appears in each Chapter of American Sniper. Click or tap on any chapter to read its Summary & Analysis. Below you will find the important quotes in American Sniper related to the theme of Country vs. Family. "I would lay down my life for my country," he answered. "How is that self-centered? That’s the opposite." He was so idealistic and romantic about things like patriotism and serving the country that I couldn't help but believe him. 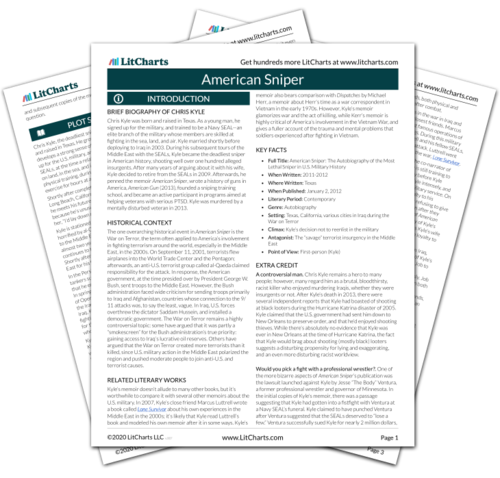 Unlock explanations and citation info for this and every other American Sniper quote. I signed up to protect this country. I do not choose the wars. It happens that I love to fight. But I do not choose which battles I go to. Y'all send me to them. I had to wonder why these people weren't protesting at their congressional offices or in Washington. Protesting the people who were ordered to protect them—let's just say it put a bad taste in my mouth. I didn’t go to a doctor. You go to a doctor and you get pulled out. I knew I could get by. As far as I can see it, anyone who has a problem with what guys do over there is incapable of empathy. People want America to have a certain image when we fight. Yet I would guess if someone were shooting at them […] they would be less concerned with playing nicely […] picking apart a soldier's every move against a dark, twisted, rule-free enemy is more than ridiculous; it's despicable. When he reenlisted anyway, I thought, Okay. Now I know. Being a SEAL is more important to him than being a father or a husband. If my son was to consider going into SEALs, I would tell him to really think about it. I would tell him that he has to be prepared. I think it's horrible for family. If you go to war, it does change you, and you have to be prepared for that, too. I'd tell him to sit down and talk to his father about the reality of things. Sometimes I feel like crying just thinking about him in a firefight. I think Chris has done enough for the country so that we can skip a generation. But we’ll both be proud of our children no matter what. Arn, Jackson. "American Sniper Themes: Country vs. Family." LitCharts. LitCharts LLC, 1 Mar 2017. Web. 25 Apr 2019. Arn, Jackson. "American Sniper Themes: Country vs. Family." LitCharts LLC, March 1, 2017. Retrieved April 25, 2019. https://www.litcharts.com/lit/american-sniper/themes/country-vs-family.